Winner cheer team tied for third place at the Gregory Invitational on Saturday. Coach Val Ewing explained the team has had to adjust due to injuries and absences. “So to got into our first competition and place was way more than we expected,” said Ewing. The team has quite a few returning cheerleaders and some outstanding seniors. “It is nice to get this first competition out of the way and get some feed back from the judges so that we can work towards our final cheer routine. I am so proud of the work these girls have put into the season so far. I expect great things from here on out,” said Ewing. The next competition will be the Winner Invitational on Sept. 10 starting at 1 p.m. in the Winner Armory. “We would love to see the community members supporting the cheer and dance teams,” said the coach. Nearly 100 Tripp County youth compete in 4-H Shooting Sports and Tim Pravecek knows them all. The Winner native has been coaching area youth since 1993. 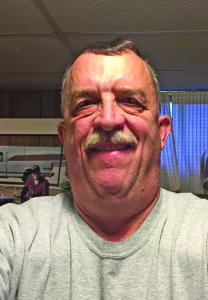 For his efforts, Pravecek will be one of four persons to receive the Rural Dakota Pride award at the South Dakota State Fair on Sept. 3. He will be honored on Farmers Union Day at the fair at 10:30 a.m.
“Shooting sports competition teaches them that winning isn’t everything and it gives them the confidence to handle themselves well under pressure,” explains the 4-H Shooting Sports Coordinator for Tripp County who has had several individuals he coached compete nationally. Tim has been helping to organize State and National 4-H Shooting Sports competitions for more than a decade now and received his Junior Olympic Archery Development Instructor Level 2 certification in 2015. Giving of his time to his hometown and county is routine for Tim who helped fundraise to build the Rosebud Arrow, Rod and Gun Club north of Winner, has served as chairman of the local Rocky Mountain Elk Foundation Chapter, is a member of Pheasants Forever, was on the board of directors for S.D. Bow Hunters Inc., financial secretary for Knights of Columbus, treasurer for the Tripp County 4-H Leaders Assoc. and director of the Shotgun portion of the National 4-H Shooting Sports Invitational in Rapid City. “Without volunteers who follow through, nothing would happen. My dad taught me the importance of following through when I was little,” Tim says. An advocate for safety, Tim has led bow safety and gun safety classes for nearly 30 years. Linkyn Petersek of Colome repeated as the junior boys all-around at the state 4-H finals rodeo in Pierre Aug. 19-21. Petersek was also the repeat saddle winner of the junior boys breakaway roping by placing sixth in the first go, 6th in the second go and winning the average. 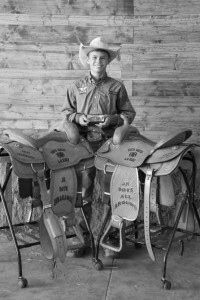 Petersek won two saddles and a buckle over the weekend. Last year he was also the state champion breakaway roper and junior all around cowboy. He will try for a three peat next year as he has one more year left in the junior division. The 2016 selection for One Book South Dakota is “Some Luck” by Jane Smiley. A discussion on the book will be held in Winner on Sept. 15 at 7 p.m. at the Tripp County Library meeting room. Books are available at the Tripp County Library for persons to read and sign up for the discussion. The leader of the book discussion in Winner will be Kathy Antonen of South Dakota School of Mines. Antonen has been leading South Dakota One Book discussions in Winner for several years. Tragedies, triumph, history and everyday life of a Midwestern farm family mix in this book. The book follows an Iowa family through the thick of the 20th Century. The Winner High School competitive dance team placed third in both pom and kick at the meet in Gregory on Saturday. “Being the first competition of the season, I was pleased with our performance,” said coach Cyndy DeMers. “Utilizing the judges comments, we know what areas we need to work on. Our goal is to continue to improve our scores each competition,” said DeMers. Winner will host its own meet on Sept. 10. 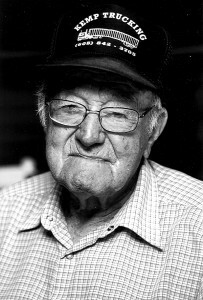 Art Kemp will celebrate his 100th birthday Sept. 10. The family will host an open house in his honor on Sept. 10 at the Holiday Inn Express in Winner from 2-4 p.m. The No. 1 rated Winner High School football team opened the season Friday night with a commanding 46-0 victory over Mobridge-Pollock. The Warriors scored 38 points in the first half on their way to a shut out. 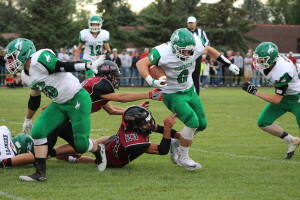 The Warriors will travel to Cheyenne-Eagle Butte on Friday. CEB has some quick skill athletes and a tall tight end. This week CEB defeated Bennett County 30-14. Colome High School football team’s opening game of the season was a thriller as it was a battle of the No. 3 and No. 4 teams in Class 9B. 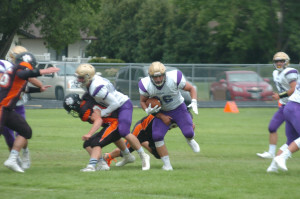 The Cowboys were on the road as they played Corsica-Stickney. Colome was nipped 16-14 after having the lead in the game. Colome will travel to Gayville-Volin on Friday. Winner Lady Warriors volleyball team opened the season with two road trips. 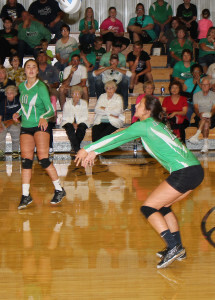 The team was defeated in three sets against Bon Homme. The Lady Warriors lost 15-25, 18-25 and 19-25. Winner lost in four sets to Miller on Aug. 25. The Lady Warriors won the first set 25-20 but lost the next three 17-25, 12-25 and 20-25. The next action for Winner will be Sept. 1 when the Lady Warriors host a triangular with two Nebraska schools. Winner will play Ainsworth at 4:30 followed by Valentine vs. Ainsworth then Winner vs. Ainsworth. On Sept 6, Winner will host Bennett Co. and Gregory. The Colome girls volleyball team opened the season on Saturday playing Burke/South Central. Colome lost 10-25, 18-25 and 19-25. Colome will travel to Gregory to play in the Gregory Invitational on Sept. 3.